Sometimes you come across a dream client: Someone who lets you explore as an artist, someone who wants you to succeed, someone who wants what’s best for them and what’s best for you. These people are hard to come by. This happened to me in early spring 2017, with the commission of the Sleepy Fox quilt. A previous customer was now pregnant with her first baby and wanted a gender neutral quilt for her baby’s woodland nursery. She was following my work closely. She loved Elizabeth Hartman’s Fancy Fox and how I had paired it with improv birch trees. (tutorial here). And she loved wood grain free motion quilting. She wanted an original fox design in my own geometric style and — here’s the kicker — wanted me to design it so that I could sell the pattern later. She wanted the perfect keepsake quilt for her baby, and she wanted me to get the most out of the process. We discuss what the client wants: Design, colours, dimensions, rough timeline. I decide on a price for my labour (read some thoughts below), and I estimate the price of materials. The client pays for the materials separately. I specify the process: I will provide two preliminary designs. The client will pick one and we will refine that design with up to two revisions (different colours, design tweaks, slightly different layout, etc.). It is not an eternal back-and-forth. I state that I require a 50% deposit before I begin the work. I give an estimated date for completion of the work based on what else is going on in my work life and personal life. If the client agrees, then we proceed. I then give some intermediate dates – when I will send the preliminary designs, when to expect the finished piece with a shipping deadline. Design work takes a certain skill set that is developed through specialized training and experience. I happen to have both formal training and experience in this realm. Also, I’ve gotten relatively fast at it, and I pay for software to allow me to do it efficiently and well. And there is no reason that I should be penalized for my speed, which comes from experience. Therefore I charge a higher rate. Execution I charge less for. To be honest, I am not that experienced in piecing, basting, quilting and binding. I’ve only been seriously doing it for about 18 months. My workmanship is not top-notch, and as a result, my results are not top-of-the-line. I’m might also be slower at it than a more experience person and I make more mistakes that I have to fix. So why should my client be penalized for my slowness? Therefore I charge a lower rate. The client and I shopped for fabric together at Patch and found the perfect combination of colours and a Dear Stella Pine Grove backing. I also had some hand-printed Keephouse scraps in black and white to add to the improv birch trees. The sky colour is Essex Yarn-dyed Linen; I love the texture of these linens, both visually and in a tactile sense. It took me longer than I had estimated originally, but I had such a good time putting it together that it didn’t bug me, as it sometimes does. And also, I considered it part of the upfront time that pattern design takes. 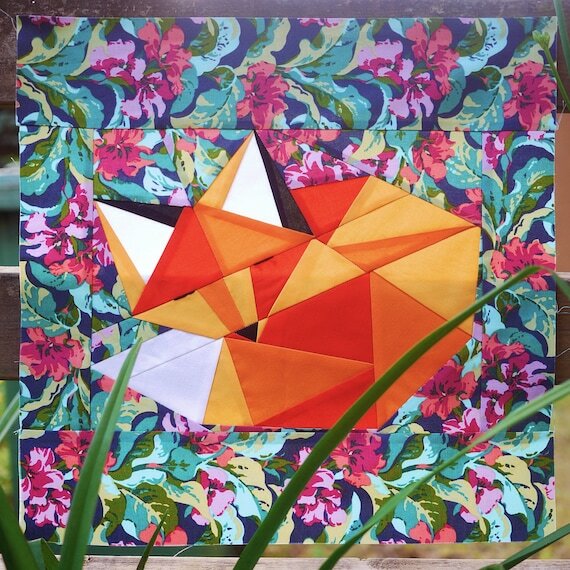 The Sleepy Fox paper piecing pattern is available as a PDF download here. A satisfied heart that was full of gratitude. That’s what I came away with. Lucky me. Love your foxy quilt and thanks for sharing your commission work process. Great info. I really enjoy posts like this about the process and pricing. I feel the same way about rates, tho my design process is longer and the sewing part shorter. I figure it works out in the end. That is so cute! Love this and thanks for sharing process. Your quilt is SEW adorable! It seems that we go about pricing the same way. I, too, value a client who allows for artistic freedom. Never will I forget the client who wanted her child’s T-shirt quilt in chronological order… that won’t happen EVER AGAIN!!! That does not sound like fun. Lessons learned! Found your post thanks to Crazy Mom Quilts’ linky party. I love your quilt! Thank you for the birch tree tutorial too! This quilt is stunningly adorable! I just love it! Thanks for the info on the process. My daughter is expecting their first child and shared your fantastic quilt. I’ll be anxiously awaiting your pattern. Please don’t wait too long – she’s due in December!